Archaeology is inherently collaborative, especially on a major project like the Eagle Nest Canyon Expedition. And that for me is a cat’s meow – building and working closely with a stellar set of collaborators. For us it starts with the landowners, Jack and Wilmuth Skiles, who for over 60 years have protected the archaeological sites we have the privilege of studying. Their house overlooks the canyon and they follow our progress closely, helping in every way they can. Jack’s 1996 book, Judge Roy Bean Country, tells the history of the area through colorful vignettes he learned by interviewing old timers and digging into old newspaper accounts and court records. Readers of this blog have already met or will soon meet our core crew members as they take turns making blog entries and add a bit about themselves. Today is my day to chip in. I am an assistant professor of anthropology at Texas State University in San Marcos, and I have been doing archaeology mostly in Texas since I was an undergraduate at UT-Austin in the mid-1970s. I am also one of the editors of www.texasbeyondhistory.net, where you will find several online exhibits on the archaeology of the Lower Pecos Canyonlands. If you are just learning about the area, start with the exhibit by that name, www.texasbeyondhistory.net/pecos. For an introduction to our canyon, see www.texasbeyondhistory.net/bonfire/caretakers.html where you can learn more about “The Land and Its Caretakers” and take a “Virtual Tour of Mile Canyon.” Eagle Nest Canyon is also known as Mile Canyon because it is about a mile from the mouth of the canyon to its abrupt ‘box’ head. Back to our collaborators. The Shumla Archaeological Research and Education Center is our key partner on this project. Under the leadership of Dr Carolyn Boyd, the Shumla School has built an amazing program of hands-on education and systematic rock art research right here in the Lower Pecos. Shumla is based in Comstock and our field headquarters is the Shumla Campus on the Shumla Ranch along the lower Pecos River about 15 minutes east from Langtry. Shumla is contributing to this expedition in many other ways. 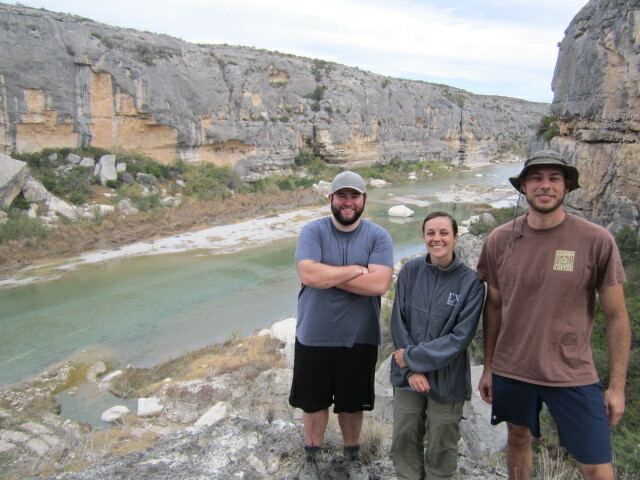 Two of our crew members, Jeremy Freeman and Vicky Muñoz, are Shumla staff members who are ‘on loan’ so to speak as part of Shumla’s Border Canyonlands Archaeological Project. Shumla also loans us critical equipment such as a total data station and helps provide field transportation. Our partnership with Shumla helps underscore the multi-faceted nature of Lower Pecos archaeology – the rock art on the rockshelter walls and the chewed up lechuguilla quids we find beneath the surface are part and parcel of the ‘whole enchilada,’ meaning the lives of the Indians that called the canyon home for so many generations. Thanks for the chance to visit! Stay safe–(that goes for you too, feral kitten).